Perfect for privacy screens and windbreaks, Black Hills Spruce is a slow-growing, compact tree, but slow growth equals wonderfully dense growth even when young. Unlike many of the faster growing evergreen species, you cannot see through the Black Hills Spruce as the tree matures. It’s short bright bluish green needles and a dense, conical shape makes this evergreen species a landscaper’s friend. Black Hills Spruce is virtually immune to the most common spruce pests and is very tolerant of drying winter winds. These characteristics make it ideal as an ornamental, privacy screen or windbreak if you have some patience with it’s slower growth. Black Hills Spruce can reach heights of up to 50 feet over a life span of up to 300 years. 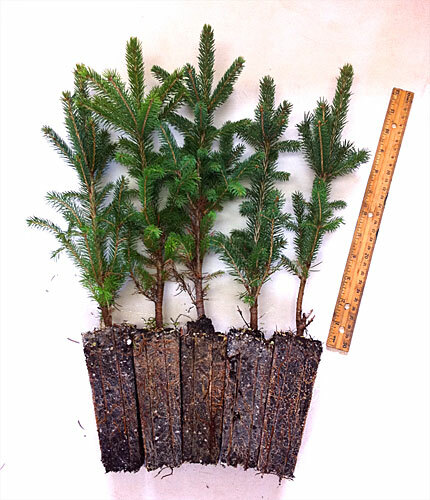 Although named after the South Dakota region in which it is naturally found, Black Hills Spruce actually thrive in a much wider range of cooler, moist regions, including states as far south as Georgia if planted at a higher elevation. This species makes for a very useful ornamental spruce.